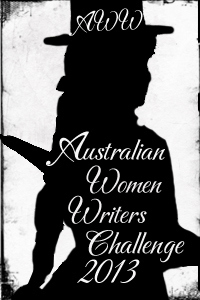 Australian Women Writers Challenge 2013 completed! Well, as the year draws to a close I learn that the Australian Women Writers Challenge is gearing up again for 2014. Will I gird up again? Probably. I nominated myself for the ‘Franklin’ level (read 10, review 6) and exceeded that. I also vowed to focus on female historians in particular. Here are my reviews, and yes, this is why I haven’t finished my thesis. “But it’s all FEEDING the thesis” I bleat in self-defence. A couple of weeks ago I thought that I had finished the best book that I would be reading during 2013. I was premature in my declaration. This is the best book that I have read this year, and in this case, I have no qualms at all about the behaviour of its author as a professional historian. Kirsten McKenzie’s earlier book Scandal in the Colonies is one of the books that has shaped my approach to my own research. Her portrayal of colonial life in the early nineteenth century as a criss-crossing of networks and connections between different colonies across the globe rings true for ‘my’ judge and the other officials that he encountered during his career, as a quick glance through the Australian Dictionary of Biography will attest. She writes clearly, with humour, and interweaves human stories into a robust and insightful theoretical framework. She’s the sort of historian I wish I could be. In fact, as she explains in the epilogue, it was her concern as a professional historian with the accuracy of her footnotes just as Scandal in the Colonies was about to roll off the press that brought her to writing this book. As part of the History Wars of the Howard era, Keith Windschuttle challenged the historiography of aboriginal/settler conflict, largely on the basis of the accuracy of footnotes. 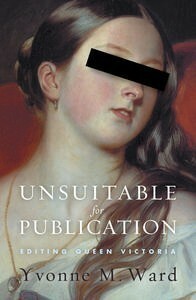 Like many historians, I should imagine, McKenzie became increasingly “twitchy” (as she puts it) over her own footnotes, and so, suffering “footnote paranoia”, she returned to the story with which she opened Scandal in the Colonies and found it even more fascinating than when she encountered it the first time. It was the case of the putative Viscount Lascelles – in reality, the implausibly but actually named John Dow- a convict who served out his time in Van Diemen’s land after being transported for swindling using yet another false identity. On the expiry of his sentence, he traversed the NSW interior, claiming that he had been commissioned by the Secretary of State to inquire into the proper treatment of assigned convicts. He claimed that he was the eldest son of the second Earl of Harewood- a claim haughtily denied by the Earl back in England whose eldest son, in fact had been disinherited after making a series of disastrous liaisons. As part of his ruse as Commissioner of Inquiry, ‘Viscount Lascelles’/John Dow eloped with a young woman and ended up in the Sydney Supreme Court in an unsuccessful attempt to rescue her from her parents who had reclaimed her, only to see her married some time later to the nephew of the future Chief Justice Dowling who heard the case. He was subsequently returned to the Supreme Court after his deception was discovered- where, yes! he encountered ‘my’ Judge Willis! In Scandal in the Colonies, the anecdote takes less than two pages. 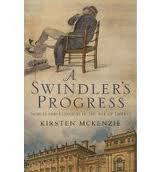 In A Swindler’s Progress it effortlessly fills 300 pages. Her earlier book Scandal in the Colonies is a tapestry of such stories, woven between Sydney and Cape Town between 1820 and 1850. It has many theoretical insights that make you stop, reread, and realize that things are falling into place. In this second book, she makes this theory come alive as she meanders along a story that crosses years and oceans, looping back on itself, with deceptions and evasions and disappointments and anxieties in multiple settings. It is not necessarily a straightforward chronology, first in one country, then the other, although the structure of the book does support this rather simplistic approach. The book is far more discursive than this, stopping to explore phenomena and events only tangentially connected with the main narrative thread. It is far more a ‘life and times’ of a phenomena than a biography of Lascelles in both his authentic and false identities. She need not be defensive. She is a master storyteller who uses the human to enliven the theoretical, and the insights of the scholarly enrich her narrative of lives lived with contingency, imperfection and incomplete endings. This is the best book I’ve read all year. Sourced from: my shelves- a Christmas present from my husband in 2009. Hmmm…… it took me a little while to get round to reading it. This will be, I think, one of my last postings to the Australian Women Writers Challenge for 2013. By chance I found myself reading two memoirs concurrently over the last week. The first, Unpolished Gem was for my bookgroup and the second, The Lucy Family Alphabet was just a bit of fluff to read on nights when I was too tired to read anything else before going to sleep. I must admit that I’m not completely sure of the difference between memoir and autobiography. I think of a memoir as being a more consciously constructed thematic work than an autobiography. A memoir mounts (perhaps a bit strong– suggests?) an argument and the experiences written about are selected to support the overarching theme that the author/narrator has chosen. There’s often a central motif that drives the work (gem, alphabets…) I wouldn’t want to be held too strictly to the distinction between the two, though. 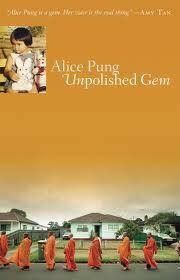 Alice Pung: Unpolished Gem, 2006, 280 p.
“This story does not begin on a boat. Nor does it contain any wild swans or falling leaves” announces the blurb on the back cover. Well, thank heavens for that, say I. The world certainly doesn’t need yet another Asian three-generation book written by a Westernized daughter. Alice Pung was twenty-five when this book was published to great acclaim. It tells of growing up in Braybrook as the eldest daughter in a Chinese/Cambodian family who had arrived in Australia in the wake of Pol Pot’s Killing Fields. Her father owns a nearby Retravision store and her mother is an outworker making jewellery which she sells to retail stores. Her paternal grandmother lives with them, Alice has several younger sisters and brothers, and there are blood aunts and other nominal ‘aunties’ within the Vietnamese/Cambodian community in which they live. Interwoven with her own chronology of primary school- secondary school- university there are flashbacks to her parents’ early experience in Australia. She is very conscious of her status as eldest daughter in a family fighting hard to find their own place in a new society. As a daughter, she is an ‘unpolished gem’ compared to the highly polished lustre given to eldest sons, and during her final year at high school she suffers a breakdown under the pressure of her own high educational expectations, the drudgery and imposition of looking after her younger siblings, and her own attempt to fit in with her Australian peers and yet remain the ‘good’ girl. This was the second time that I have read this book. I had been rather lukewarm about it when I read the first time, just after it had been published, and I wouldn’t have chosen to re-read it except that it was a bookgroup selection. I think that I appreciated her writing more the second time around. Her story is told with insight and humour, although I (again) found myself becoming increasingly annoyed at the italicized internal dialogue as she grew older. Just as I did the first time, I again thought that the epilogue was clunky and rather too mannered in an attempt to bring what is truly an unfinished memoir to a close, given that the author was only several years older than the self she was writing about in the closing pages. And so…. to the other memoir. 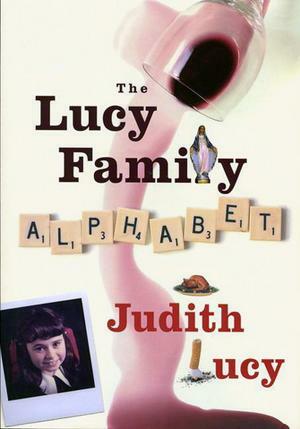 Judith Lucy: The Lucy Family Alphabet , 2009, 296 p.
I don’t really know why I picked this book up, given that I’m not particularly keen on the comedic persona that Judith Lucy has created. I must admit that I find the exaggerated, world-weary drawl rather wearing, and the constant mining of her own life for material a little tedious and self-indulgent. So to willingly subject myself to more seems rather perverse. On the other hand, the chapters were short (most about 2-3 pages in length) and not particularly chronological, so that I could dip into it at will. Like all good Alphabets, the book starts off with A…. for adoption, and the chaotic Xmas family dinner at which she learned that she was, in fact, adopted. Normally in a straight autobiography this bombshell would come near the end of the book but she plops it onto the reader in the opening pages, then shuttles back and forth around this revelation, letting the letters of the alphabet supposedly drive the narrative rather than chronology. The alphabet structure is rather artificial- there are, for example, six letter ‘A’ stories- and although the stories seem random, the longer you stay with the book, the more layered her anecdotes become. There is more of an ending than just reaching the letter ‘Z’. And even though the narrative voice is just the same as that distinctive drawling voice you’re likely to hear on a comedy show on the ABC, there’s more than just a string of acerbic, pointed anecdotes. At times it is poignant and yes- wise (even though Judith Lucy the comedian would probably snort at such a description). Judith Lucy wrote her book at about the age of 40; Alice Pung would have been in her early twenties. Can an author write a memoir in her twenties, I wonder? I tend to think maybe not. Or, rather, even though it might lose its immediacy, I think that perhaps it would be a better memoir left to marinate for a few decades more. Two memoirs- two Australian women writers. I must add it to the Challenge! I have been the first person in my immediate family to go to university, although several of my cousins did as well. I find it hard to imagine what it would be like to grow up as the child of academics and intellectuals. Part of my fascination with this book was reading about the child of historians becoming a historian herself. Sheila Fitzpatrick’s father was the left-wing historian and public intellectual Brian Fitzpatrick and her mother Dorothy Fitzpatrick taught history at Monash University. This book is the second memoir written by Sheila Fitzpatrick, noted Soviet Historian, and now Honorary Professor at the University of Sydney after a long academic career overseas. Her first memoir was called My Father’s Daughter which, from the title, I assume explores the generational issue further. In this second memoir we are taken on the first steps of the author’s academic journey as she travels first to Oxford University to undertake her doctorate in Russian history. Her dissertation topic was Anatoly Vasilyevich Lunarcharsky, the Russian author and politician who was appointed Commissar of Enlightenment between 1917 and 1929. Her thesis was titled ‘Lunarcharsky as Philosopher and Administrator of the Arts’ and it ended up being published by Cambridge University Press as The Commissar of Enlightenment in 1970. It was the stepping stone to Fitzpatrick’s eminent career as a historian of Russia. It was not surprising that a daughter of Brian Fitzpatrick would be attracted to such a topic, but she claims that “Becoming a Soviet historian wasn’t a foregone conclusion, even with a left-wing father and a bit of Russian” and that from the age of about 13 she had become “less of a true believer in my father’s causes than earlier” (p.7). Fitzpatrick’s father had died by the time she embarked on her academic career, and yet one senses that she continued to have an intellectual argument with him in her head at least. The book is not so much a ‘ coming-of-age ‘story , as a story of ‘coming-as-historian’ as she finds her own mentors and develops her own confident intellectual stance as a historian. In the 1960s it was common for first class honours students in history to undertake their doctorates overseas, and so she trod a well-worn path. She was not terribly impressed with St Anthony’s College at Oxford and the supervision she received there. In 1966 she applied for a British Council exchange scholarship to enable her to live in Moscow and to use the archives there for her research. Her application was refused initially but eventually received after she embarked on a rather utilitarian marriage to a fellow British student. As part of the preparation for her stay in Moscow, she and her cohort of fellow researchers were warned against spies- indeed, against friendships with Russian people, full stop. Like her fellow students she ignored this advice, and this book describes her friendship with Igor, a middle-age friend of the now-dead Lunarcharsky, and Irini, Lunarcharsky’s daughter, that developed as she delved deeper into her research. This book emerged from a long article that she wrote in the London Review of Books, and you can get the flavour and much of the content from reading this article alone (which is often the case with LRB articles). In fact, it’s such a detailed article that you barely need to read the book! I must admit that, with little knowledge of post-revolutionary and Cold War Russia (or at least, I’ve forgotten what I ever did know), I found the content aspects of this article easier to follow than the book. But it’s well worth going to the book itself because her research is only one facet of her story: it’s also about friendships, authenticity, insecurity in a clandestine world, and history-writing. 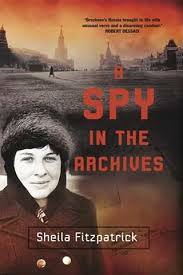 She writes of the joy that all historians feel when working in archives, but to her, working in the Soviet archives was particularly pleasurable- in fact, she pitied those British historians who would roll up to the PRO, ask for a file, and have it handed over instantly. In Moscow, not only was there the challenge of even getting access to the archive, but once admitted, there were strict limits on what was made available because the thesis topic is treated like a straitjacket. There’s no chasing off down rabbit holes and false leads and serendipitous rainbows here: if a file was not directly related to the topic as you first conceptualized it, then you couldn’t see it. Foreign researchers were not given access to catalogues, so there was no way of knowing what to ask for. Contact between foreign researchers and their Russian counterparts was strictly forbidden, and the archivists held enormous power over what you could see and what you could not. It all became a bit of cat-and-mouse, albeit playing with a cat with sharp eyes and sharp claws that you could not always assume would remain sheathed. However, one aspect in the book that does not come through in her article is the process of the historian writing a memoir. She mentions at one stage that one of her husbands had returned the letters she had written to him, in order for her to write this memoir. She uses the correspondence between her mother and herself as well, triangulating it against the diary that she wrote at the time. She often says that she cannot remember certain events that are documented, and is often nonplussed to explain things that she had written at the time. As a result, it is a careful memoir that has a sense of distance between the writer and what she remembers (or does not remember) about the events she experienced. I enjoyed this book, and the undercurrent of Cold War tension that runs underneath it. I liked the reflexivity of her writing and the caution with which she treats the memoir genre. I wish that I knew more about Russia, because I did find the details of her research rather overwhelming at times but not so much that I was ever tempted to give up. I resisted the temptation to Google, trusting her to take me on the journey, and she did not let me down. I’m posting this to the Australian Women Writer’s Challenge under the History/Memoir/Biography section- and, for this book at least, it fits all three categories! 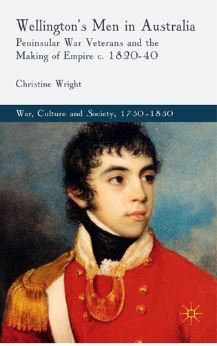 Morisset is one of the men that Christine Wright deals with in her prosopographical study of men who served during Wellington’s Peninsular campaigns on the Iberian peninsular from 1808 to 1814. Prosopography was defined by the historian Lawrence Stone in a foundational article as “the investigation of the common background characteristics of a group of actors in history by means of a collective study of their lives”. As such, it falls half-way between rather sketchy biography and a more statistical analysis. I’ve read several legal prosopographies, and one or two about bureaucrats: it seems to be used mainly in the context of writing about careers (although it could just as easily be applied to any group of people). It is well suited to Christine Wright’s endeavour. When reading local histories sited in the British colonies during the 1820s, 30s and 40’s you come across ex-military figures again and again, and in this book Wright takes this cohort of soldiers, bonded by their experience in the Peninsular campaigns, and traces the rest of their careers throughout the empire. During the Napoleonic Wars the need for manpower rendered the old system of purchasing of commissions inadequate. Young soldiers of limited means, who would not normally have had the capital to purchase their positions not only had a career pathway open up for them during the war, but also were eligible for half-pay and land grants after the war. As veterans, they were able to draw on the networks of influence to gain positions across an empire which was calling out for their skills in logistics, engineering and surveying. The half-pay entitlement was insufficient to live on in Britain which drove veterans to look for employment overseas, and from the British Government’s point of view it was a way of cutting the cost of numbers on the half-pay list while filling appointments with skilled men and their families. In the colonies, veterans in garrison regiments and ex-soldiers who had sold their commissions fitted particularly well into the military structures of early NSW and Van Diemen’s land. As the colonies evolved away from penal settlements to free colonies, these ex-military men were well placed to take up civil positions of power and authority in the community. They obtained large grants of land complete with convict labour and accrued the status that accompanied being a landowner- something that they probably never would have been able to achieve in Britain. But the army had given them more than just military skills. The drawing and surveying skills developed during the war were put to use in colonies that were still exploring their spaces. Beyond their practical uses, these skills flowed into art as well, where ex-veteran painters, alert to the stark light and harshness of the Spanish terrain, were able to capture the light of Australian landscape in a way not seen amongst painters who had spent all their lives in the soft lights of England or wooded European settings. Accustomed to making written reports, many of the veterans wrote their memoirs of the Peninsular campaign but extended their memoirs into their new settings as well. On this basis, Wright gives an insightful re-reading of the Waterloo Creek massacre from a strictly military viewpoint. The British Army ceased fighting on the frontier in the latter half of 1838 and it was left to the settlers or to Border or Mounted Police which, although joined by many ex-soldiers, were not counted as part of the British Army regiment numbers. She suggests that this changed the nature of frontier ‘clashes’ and not necessarily for the better. The real grunt-work of this book comes in the appendices which lists influential British Army Officers in the Australian colonies who were veterans of the Peninsular War. They are listed by name, regiment, date and place of arrival, place of death, with a brief summary of the military and civil positions they occupied in Australia. There’s many familiar names there: several governors (George Gawler in South Australia; Governors Darling, Brisbane, Gipps, Bourke, in NSW), explorers (Sturt, Major Mitchell, Lockyer), commissariats (Logan up in Moreton Bay, G.T.W.B Boyes in NSW and VDL) and commandants (Thomas Bunbury, Joseph Childs, poor damaged James Morissett in Norfolk Island), surveyors (Light in South Australia, and many magistrates and crown land commissioners (Fyans). ‘to pave the way for the free settler’: British Soldiers on the Frontier. The book emerges out of the author’s PhD and I think that it is still detectable there. At times the language was a little stilted and the author’s interventions rather forced. I was mystified by the capitalization (or lack thereof) of certain names, especially the Duke/duke of Wellington. The reader meets many of these veterans in several chapters in different guises. The backgrounding for individual characters comes in various places. For example, Archibald Innes’ background story comes at p. 44; G.T.W. Boyes’ comes at p. 132 even though they have been mentioned briefly in many other places. While spreading her net wide, there is no one place where she introduces key figures as, for example, Inga Clendinnen did in Dancing with Strangers. I found myself wondering if perhaps this might not have been a better strategy: I found myself more interested in characters once I’d been formally introduced to them. Certainly the ‘networked’ aspect comes through clearly as people are appointed to one position after another, often through the sticky web of the Darling/Dumaresque connections in Sydney, or through the good graces of Secretary of State for the Colonies Sir George Murray in London, himself a Peninsular veteran. It is telling that the book takes such a short timespan (twenty years) as its period of analysis. By 1840 the militarized nature of Australian society had been overlaid by move towards civil appointments, bureaucratic rather than martial procedures and even representative government. As often happens, once you’ve been alerted to a phenomenon, you tend to see it everywhere, and this is the case with this book. If you flip through the entries for early settlers in the Australian Dictionary of Biography you’ll see the military connections with new eyes and wonder why it wasn’t more apparent before. I am posting this for the Australian Women Writer’s Challenge under the History/Biography/Memoir section. It is an academic text, and needs to be read that way. 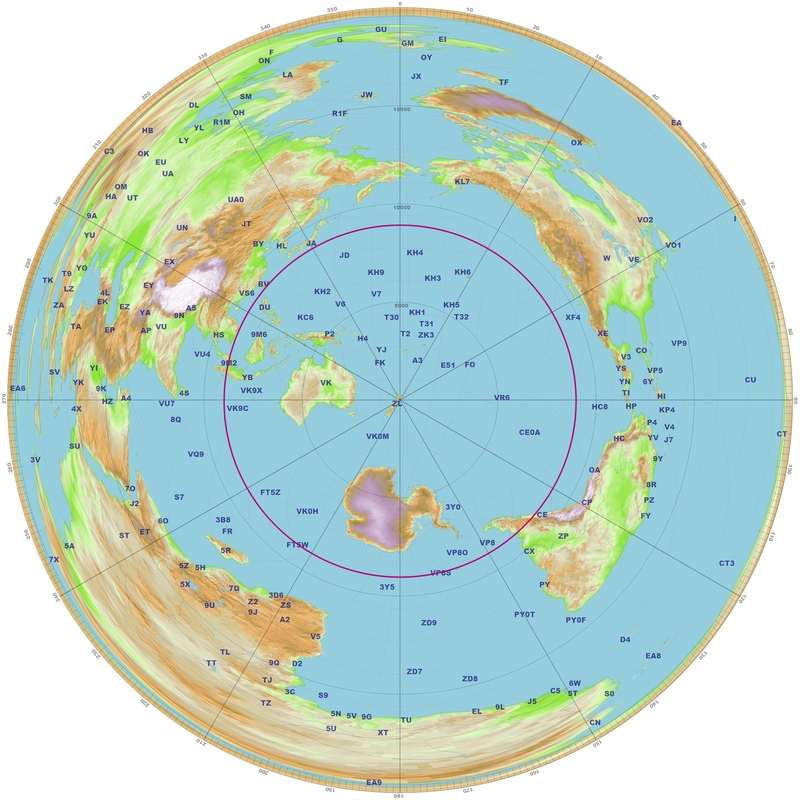 It’s a map showing the great circle route of the southern ocean. Dotted around and radiating out from the centre of the circle are the islands of the southern ocean: the larger land masses of Antarctica, Australia, New Zealand, and although you can’t see it here, Macquarie Island, Pitcairn Island,, Kerguelen, Chatham Island, Tahiti, Society Islands, Solomon Islands, Falkland Islands, South Georgia. It’s a view that challenges our land-mass bias by emphasizing the ocean and the space, and the relative proximity of small islands flung into the centre of the Indian, Pacific and Atlantic Oceans. The second decentering reflects the focus on whaling and sealing in this book right up to 1870. 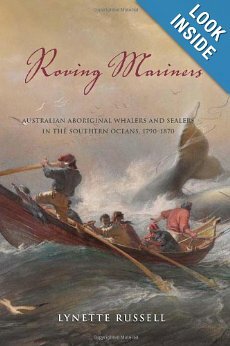 We’re often told that whaling and sealing were primitive, increasingly marginal endeavours which were eclipsed by the pastoral industry and then the gold rushes that super-charged the Australian economy in the 1830s, 40s and 50s. It’s odd: I’ve been reading through 1840s newspapers for years now seeing mainly sheep, sheep, sheep but after reading this book suddenly I saw references to whaling all over the place- not long articles mind you, but the steady ongoing enumeration of whaling ships in the shipping news and, I must admit, the frequent presence of whalers and sealers in the criminal news. Lynette Russell is the director of the Monash Indigneous centre at Monash University, and is herself of Tasmanian Aboriginal descent. Her own personal engagement with the history of whaling and sealing was prompted by a discussion she had with an elderly distant cousin who, like her, acknowledged descent from both Aboriginal and European ancestors. He explained that his great-great-grandparents had been sealers, she a Tasmanian Aboriginal woman and he a British seaman. When she sympathized with the virtual slavery in which Tasmanian Aboriginal women were kept, he pulled her up. They were both sealers, he said, rather than a sealer and his ‘woman’ (p. 22). This set her off to explore in a more nuanced way the complexity of the Southern Australian sealing industry. This personal stance is reflected in the history that she writes in this book. The whaling and sealing industries of the Southern Oceans were always ethnically diverse with a strong representation of ‘coloured seamen’: African and Native Americans, Native Canadians, Pacific Islanders, Maori and Aborigines. Her sources are the archival records of the maritime industry including logs, ships’ records, diaries, journals, visual materials including photographs and European artifacts. After trawling through the sources, she concluded that there was ultimately a paucity of information about the ‘coloured seamen’ that she wished to write about. This, she says, enabled space for her to imagine their lives and labours and to be “intentionally creative” (p. 16). She plunged herself into the experience of whaling and sealing: standing on the deck of a ship in the midst of a pod of sperm wales; standing on Kangaroo Island amongst a colony of noisy, smelly fur seals. I must admit that there is much in her upfront description of her political stance and methodology that discomfits me (and I should imagine that within Indigenous politics, some would be even more uncomfortable), but I found little in the text itself that unsettled me. Instead, I sensed that she had read widely and imaginatively and that there was a strong tethering in verifiable, if diverse, sources (with one major exception where I felt that her creative imagination was straining the evidence too much). She is very much present in the text. Her argument is strenuous and well argued, and it has the effect of challenging easy assumptions. She focusses in particular on two men: Tommy Chaseland, and William Lanne. Thomas Chaseland was born illegitimately to an Aboriginal woman and a white emancipist father. He was sent to work in the shipping yards of the Hawkesbury River and signed on to the Jupiter. After a succession of stints on various whaling ships, he settled in New Zealand where he became the husband of a high-ranking Maori woman and made his home on the isolated Codfish and Stewart Islands before moving to the Fiordlands west of Stewart Island where he and his wife worked on a whaling station. William Lanne, often incorrectly described as ‘the last Tasmanian Aboriginal male’ is more widely known, largely in terms of the outrageously disrespectful treatment of his body after his death. Russell examines Lanne as one of three Tasmanian Aboriginal men who pursued their luck at sea alongside Captain Henry Whalley and Walter George Arthur. The details of what happened after his death almost obscure the life that he lived, but Russell attempts to reconstruct it. Reconstruction of a life becomes even more difficult when she turns her attention to Tasmanian Aboriginal women. Here she follows two other historians, Rebe Taylor who examined Kangaroo Island and Lyndall Ryan who focussed on Bass Strait and Tasmania. She acknowledges her debt to this work, and tries to take it further by endeavouring to bring the wives and women from the shadows of the narrative. It is a difficult task that involves reading against the sources, many of which were written by the missionaries who tried unsuccessfully to get the women to leave the islands. She is extremely careful in her discussion of freedom, action and choices and her caution in the text behooves us to read closely and to attend to her hesitations and qualifications. This is a beautifully written and nuanced reflective history. It is at the same time easy to read and yet requires much of the reader as well in terms of weighing the argument and her use of sources. A review of the book is available on H-Net. I am posting this review to the Australian Women Writer’s Challenge under the History/Biography/Memoir section. We’re told that it’s all about controlling the narrative. Politicians all do it, it seems; and we risk losing control of our narrative by putting too much of our lives onto the internet, we’re told. All this might seem far removed from good old Queen Victoria, but on reading Unsuitable for Publication, I’ve realized that it isn’t. Then and now, it’s all about image creation and the interplay between the image we think we have constructed and the image that others might massage or manipulate from our words.